Tag Archive | "Red Bellied Pacu (Piaractus brachypomus)"
The Red Bellied Pacu (Piaractus brachypomus) locally known as the Pirapitinga, is probably one of the most commonly kept species available to tropical fish keeping enthusiasts. It is primarily found in the main river channels of the Rio Orinoco and Amazon river basins in Bolivia, Brazil, Colombia, Peru, and Venezuela. The species is locally prized as a food fish and has been introduced into many areas where it is farmed. In southern Florida, they are considered an invasive species and are commonly found in many of the canals, lakes, and rivers of Broward and Dade Counties. Red Bellied Pacu are a peaceful, shoaling species that prefer shallow, slower moving waters with overhanging vegetation which they target to feed. During the rainy flood season which occurs between November and February, huge schools of Red Bellied Pacu move into the flooded forests to spawn and rear their young which remain in the flooded plains for the first few months of their lives. In it’s native habitat, Red Bellied Pacu feed primarily on nuts, fruits, and seeds which drop into the water column, however, they are opportunistic feeders that will eagerly munch on caterpillars, insects, small fish, zooplankton , and crustaceans when fruit and nuts are scarce. Red Bellied Pacu fill an important niche in the ecological system of their native habitat. The seeds from the fruit and nuts that they eat pass through their digestive systems undamaged and are spread into other areas of their range as they travel. 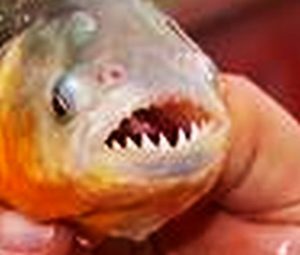 Except for their teeth, juvenile Red Bellied Pacu (Piaractus brachypomus) closely resemble the Red Bellied Piranha (Pygocentrus nattereri). Both posses a distinctive red belly and chest, but the Pacu has a set of crushing chompers that look remarkably like human molars (Left). Although they are not aggressive, they have extremely powerful jaws and a crushing bite than cause an absent minded tropical fish keeping enthusiast a lot of pain if they are not careful feeding them or maintaining their tank. Mature females are identical to males except for their more rounded bellies. Juvenile Red Bellied Pacu are a shoaling species that lose their red bellies as they mature. Adults tend to become more solitary and can grow to almost 3 feet in length. At this stage they are often misidentified with their cousins the Tambaqui (Colossoma macropomum). 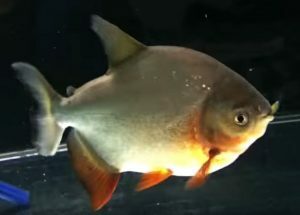 Because of their large size as adults, Red Bellied Pacu require a huge tank of at least 600 gallon capacity if they are being housed in a community setting. Keeping them with small fish should be avoided, but large sedentary species like Arowana, large Pimelodid, Loricariids, or Doradids catfish, large cichlids, or other large characins can safely be housed in the same community setting. Any substrate can be used but planting their tank is a futile effort as the plants will be eaten. Choose some river rocks , water smoothed boulders, and a few large pieces of driftwood or bogwood to decorate the tank, but the most important factor in keeping Red Bellied Pacu is to provide plenty of free swimming space. Because of their large size, Piaractus brachypomus excrete copious amounts of waste which requires frequent water changes and an efficient filtration system. A large, external, wet/dry biological filtration system or a large pond filter is highly recommended. water chemistry, they are aquacultured in South America, the far East, and other areas as a food source. They have been introduced into many lakes and ponds in Thailand and Malaysia as a sport fish. Wild Piaractus brachypomus are primarily herbivorous that feed on fruit, seeds, and nuts. In an aquarium environment, they will readily accept floating omnivore pellets or sticks along with a variety of fruits and vegetables. They love lettuce, spinach, apples, peaches, grapes, bananas, peas, carrots, cabbage, and just about any vegetable matter you can come across. 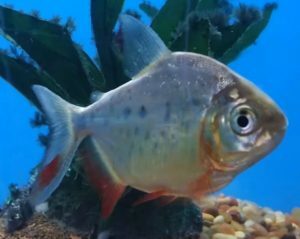 Except for some of the warmer southern States where they are illegal to keep, Red Bellied Pacu can be purchased as juveniles from specialty tropical fish keeping shops or online at very reasonable prices.